According to many evolutionists today, dinosaurs are really not extinct but rather are feeding at our bird feeders even as we speak. For many evolutionists, it would seem, birds simply are dinosaurs. With this sort of bias, it is quite easy for evolutionists to find supposed evidence to support the notion that birds evolved from dinosaurs. 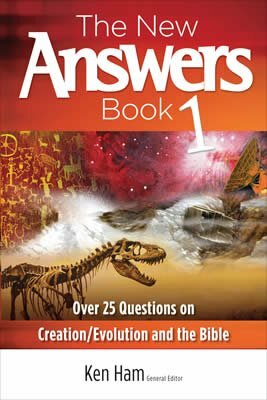 But what does the Bible tell us about the origin of birds, and just how good is the scientific evidence that some dinosaurs evolved into birds? What Does the Bible Say about the Origin of Birds? Birds were created on Day Five and dinosaurs on Day Six. In the first chapter of Genesis, verse 21 , we read that on Day Five of creation, God created “every winged fowl after its kind.” This includes birds that flew above the earth ( Genesis 1:20 ). Man and land animals were created on Day Six of the Creation Week ( Genesis 1:24–31 ). Were there land birds that didn’t fly originally? I would leave open the possibility, but a discussion of this is beyond the scope of this chapter. Most ornithologists say that these birds are secondarily flightless (i.e., they lost the ability to fly). This would be due to variance within kind or to mutational losses since creation. So, the best possibility is that birds were created on Day Five as flyers, and some have lost this ability, but I wouldn’t be dogmatic. The extinct aquatic reptiles, such as the plesiosaurs, and the extinct flying reptiles, such as the pterodactyls, are not classified as dinosaurs, and most evolutionists do not believe that they evolved into birds. Thus, for the Bible-believing Christian, both the fact of creation and the order of creation affirm that birds and dinosaurs originated separately. Genesis 1:21 says that God created every winged bird after its “kind.” The following verse says they were to multiply, or reproduce; so the logical connection is that birds of the same kind can reproduce. The Hebrew word for “kind” in Genesis refers to any group of animals capable of interbreeding and reproducing according to their type. For example, all dogs and dog-like animals, such as wolves and coyotes, are capable of interbreeding and thus would represent one “kind,” even though some are classified today as different species. This does not mean, however, that all birds represent a single created kind and thus share a common ancestry. The Bible tells us that there are many different bird kinds (plural). The Levitical dietary laws ( Leviticus 11:13–19 ), for example, list many different bird kinds as being unclean. This gives further biblical support for multiple created bird kinds. What Do Evolutionists Claim about the Origin of Birds? Evolutionists have long speculated that birds evolved from reptiles. At one time or another, virtually every living and extinct class of reptiles has been proposed as the ancestor of birds. The famous Darwinian apologist Thomas Huxley was the first to speculate (in the mid 1800s) that birds evolved from dinosaurs. While this notion has gone in and out of favor over the years, it is currently a popular view among evolutionists. Indeed, the origin of birds from dinosaurs is touted as irrefutable dogma in our schools, biology textbooks, and the popular media. While evolutionists now agree that birds are related in some way to dinosaurs, they are divided over whether birds evolved from some early shared ancestor of the dinosaurs within the archosauria (which includes alligators, pterosaurs, plesiosaurs, ichthyosaurs, and thecodonts) or directly from advanced theropod dinosaurs (bipedal meat-eating dinosaurs, such as the well-known Tyrannosaurus rex). The latter view has gained in popularity since 1970, when John Ostrom discovered a rather “bird-like” early Cretaceous theropod dinosaur called Deinonychus. An adult Deinonychus measured about 12 feet (3.5 m) long, weighed over 150 pounds (68 kg), and was about 5 feet (1.5 m) tall standing on its two hind legs. Like other theropods (which means “beast foot”), Deinonychus had forelimbs much smaller than its hind limbs, with hands bearing three fingers and feet bearing three toes. The most distinctive feature of Deinonychus (which means “terrible claw”) is a large curved talon on its middle toe. One of the main reasons that Deinonychus and other similar theropod dinosaurs (called dromaeosaurs) seemed to be plausible ancestors to birds is that, like birds, these creatures walked solely on their hind legs and have only three digits on their hands. But as we shall see, there are many problems with transforming any dinosaur, and particularly a theropod, into a bird. Seemingly forgotten in all the claims that birds are essentially dinosaurs (or at least that they evolved from dinosaurs) is the fact that dinosaurs are reptiles. There are many differences between birds and reptiles, including the fact that (with precious few exceptions) living reptiles are cold-blooded creatures, while birds and mammals are warm-blooded. Indeed, even compared to most mammals, birds have exceptionally high body temperatures resulting from a high metabolic rate. In an effort to make the evolution of dinosaurs into birds seem more plausible, some evolutionists have argued that dinosaurs were also endothermic. The difference between cold- and warm-blooded animals isn’t simply in the relative temperature of the blood but rather in their ability to maintain a constant body core temperature. Thus, warm-blooded animals such as birds and mammals have internal physiological mechanisms to maintain an essentially constant body temperature; they are more properly called “endothermic.” In contrast, reptiles have a varying body temperature influenced by their surrounding environment and are called “ectothermic.” An ectothermic animal can adjust its body temperature behaviorally (e.g., moving between shade and sun), even achieving higher body temperature than a so-called warm-blooded animal, but this is done by outside factors. One of the lines of evidence for endothermic dinosaurs is based on the microscopic structure of dinosaur bones. Fossil dinosaur bones have been found containing special microscopic structures called osteons (or Haversian systems). Osteons are complex concentric layers of bone surrounding blood vessels in areas where the bone is dense. This arrangement is assumed by some to be unique to endothermic animals and thus evidence that dinosaurs are endothermic, but such is not the case. Larger vertebrates (whether reptiles, birds, or mammals) may also have this type of bone. Even tuna fish have osteonal bone in their vertebral arches. Another argument for endothermy in dinosaurs is based on the eggs and assumed brood behavior of dinosaurs, but this speculation too has been challenged.3 There is in fact no theropod brooding behavior not known to occur in crocodiles and other cold-blooded living reptiles. All dinosaurs are divided into two major groups based on the structure of their hips (pelvic bones): the lizard-hipped dinosaurs (saurischians) and the bird-hipped dinosaurs (ornithiscians). The main difference between the two hip structures is that the pubic bone of the bird-hipped dinosaurs is directed toward the rear (as it is in birds) rather than entirely to the front (as it is in mammals and reptiles). But in most other respects, the bird-hipped dinosaurs, including such bizarre creatures as the armor-plated ankylosaurs and the horned ceratopsian dinosaurs, are even less bird-like than the lizard-hipped, bipedal dinosaurs such as the theropods. This point is rarely emphasized in popular accounts of dinosaur/bird evolution. One of the main lines of evidence cited by evolutionists for the evolution of birds from theropod dinosaurs is the three-fingered “hand” found in both birds and theropods. The problem is that recent studies have shown that there is a digital mismatch between birds and theropods. One of the most distinctive features of birds is their lungs. Bird lungs are small in size and nearly rigid, but they are, nevertheless, highly efficient to meet the high metabolic needs of flight. Bird respiration involves a unique “flow-through ventilation” into a set of nine interconnecting flexible air sacs sandwiched between muscles and under the skin. The air sacs contain few blood vessels and do not take part in oxygen exchange, but rather function like bellows to move air through the lungs. 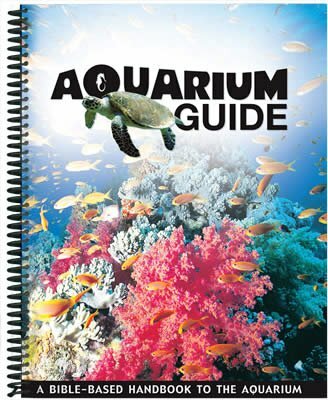 The air sacs permit a unidirectional flow of air through the lungs resulting in higher oxygen content than is possible with the bidirectional air flow through the lungs of reptiles and mammals. 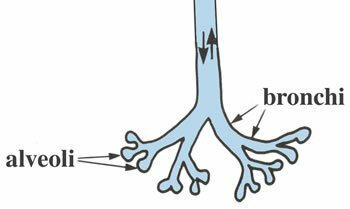 The air flow moves through the same tubes at different times both into and out of the lungs of reptiles and mammals, and this results in a mixture of oxygen-rich air with oxygen-depleted air (air that has been in the lungs for awhile). The unidirectional flow through bird lungs not only permits more oxygen to diffuse into the blood but also keeps the volume of air in the lungs nearly constant, a requirement for maintaining a level flight path. If theropod dinosaurs are the ancestors of birds, one might expect to find evidence of an avian-type lung in such dinosaurs. While fossils generally do not preserve soft tissue such as lungs, a very fine theropod dinosaur fossil (Sinosauropteryx) has been found in which the outline of the visceral cavity has been well preserved. The evidence clearly indicates that this theropod had lung and respiratory mechanics similar to that of a crocodile—not a bird.6 Specifically, there was evidence of a diaphragm-like muscle separating the lung from the liver, much as you see in modern crocodiles (birds lack a diaphragm). These observations suggest that this theropod was similar to an ectothermic reptile, not an endothermic bird. Feathers have long been considered to be unique to birds. Certainly all living birds have feathers of some kind, while no living creature other than birds has been found to have a cutaneous appendage even remotely similar to a feather. Since most evolutionists are certain that birds evolved from dinosaurs (or at least are closely related to them), there has been an intense effort to find dinosaur fossils that show some suggestion of feathers or “protofeathers.” With such observer bias, one must be skeptical of recent widely publicized reports of feathered dinosaurs. Thus far, the only supposed dinosaur fossil with obvious feathers that was “found” is Archaeoraptor liaoningensis. This so-called definitive feathered dinosaur was reported with much fanfare in the November 1999 issue of National Geographic but has since been shown to be a fraud. Feathers and scales are dissimilar. In actual fact, feathers are profoundly different from scales in both their structure and growth. Feathers grow individually from tube-like follicles similar to hair follicles. 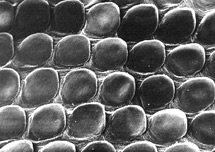 Reptilian scales, on the other hand, are not individual follicular structures but rather comprise a continuous sheet on the surface of the body. Thus, while feathers grow and are shed individually (actually in symmetrically matched pairs! ), scales grow and are shed as an entire sheet of skin. The feather vane is made up of hundreds of barbs, each bearing hundreds of barbules interlocked with tiny hinged hooklets. This incredibly complex structure bears not the slightest resemblance to the relatively simple reptilian scale. 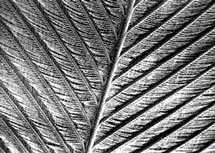 Still, evolutionists continue to publish imaginative scenarios of how long-fringed reptile scales evolved by chance into feathers, but evidence of “sceathers” eludes them. Archaeopteryx, a True Bird, Is Older than the “Feathered” Dinosaurs. One of the biggest dilemmas for those who want to believe that dinosaurs evolved into birds is that the so-called feathered dinosaurs found thus far are dated to be about 20 million years more recent than Archaeopteryx. This is a problem for evolution because Archaeopteryx is now generally recognized to be a true bird.13 Some specimens of this bird are so perfectly fossilized that even the microscopic detail of its feathers is clearly visible. So, having alleged missing links of dinosaurs changing into birds when birds already exist doesn’t help the case for evolution. For many years Archaeopteryx has been touted in biology textbooks and museums as the perfect transitional fossil, presumably being precisely intermediate between reptiles and birds. Much has been made over the fact that Archaeopteryx had teeth, fingers on its wings, and a long tail—all supposedly proving its reptilian ancestry. While there are no living birds with teeth, other fossilized birds such as Hesperornis also had teeth. Some modern birds, such as the ostrich, have fingers on their wings, and the juvenile hoatzin (a South American bird) has well-developed fingers and toes with which it can climb trees. One of the biggest problems for evolutionists is explaining the origin of flight. To make matters worse, evolutionists believe that the flying birds evolved before the nonflying birds, such as penguins. The theropod type of dinosaur that is believed to have evolved into flying birds is, to say the least, poorly designed for flight. These dinosaurs have small forelimbs that typically can’t even reach their mouths. It is not clear what theropods, such as the well-known T. rex, did with their tiny front limbs. It is obvious that they didn’t walk, feed, or grasp prey with them, and they surely didn’t fly with them! Another problem is that this bipedal type of dinosaur had a long, heavy tail to balance the weight of a long neck and large head. Decorating such a creature with feathers would hardly suffice to get it off the ground or be of much benefit in any other way. Having a true bird appear before alleged feathered dinosaurs, no mechanism to change scales into feathers, no mechanism to change a reptilian lung into an avian lung, and no legitimate dinosaurs found with feathers are all good indications that dinosaurs didn’t turn into birds. The evidence is consistent with what the Bible teaches about birds being unique and created after their kinds. Genesis is clear that God didn’t make birds from pre-existing dinosaurs. In fact, dinosaurs (land animals made on Day Six) came after winged creatures made on Day Five, according to the Bible. Both biblically and scientifically, chicken eaters around the world can rest easy—they aren’t eating mutant dinosaurs. Previous Chapter Hasn’t Evolution Been Proven True? Next Chapter Does Archaeology Support the Bible? R.T. Bakker, Dinosaur renaissance, Scientific American 232:58–78, 1975. A. Feduccia, Dinosaurs as reptiles, Evolution 27:166–169,1973; A. Feduccia, The Origin and Evolution of Birds, 2nd Ed., Yale University Press, New Haven, Connecticut, 1999. N.R. Geist and T.D. Jones, Juvenile skeletal structure and the reproduction habits of dinosaurs, Science 272:712–714,1996. A. Feduccia, T. Lingham-Soliar, and J.R. Hinchliffe, Do feathered dinosaurs exist? Testing the hypothesis on neontological and paleontological evidence, Journal of Morphology 266:125–166, 2005. J.A. Ruben, T.D. Jones, N.R. Geist, and W.J. Hillenius, Lung structure and ventilation in theropod dinosaurs and early birds, Science 278:1267–1270, 1997. U.B. Gohlich and L.M. Chiappe, A new carnivorous dinosaur from the late Jurassic Solnhofen archipelago, Nature 440:329–332, 2006. P.J. Chen, Z.M. Dong, and S.N. Zheng, An exceptionally well-preserved theropod dinosaur from the Yixian formation of China, Nature 391:147–152,1998; X. Xu, X.Wang, and X. Wu, A dromaeosaurid dinosaur with a filamentous integument from the Yixian formation of China, Nature 401:262–266, 1999; P.J. Currie and P.J. Chen, Anatomy of Sinosauropteryx prima from Liaoning, northeastern China, Can. J. Earth Sci. 38:1705–1727, 2001. P.J. Currie et al., eds., Feathered Dragons: Studies on the Transition from Dinosaurs to Birds, Indiana University Press, Bloomington, Indiana, 2004.